Some stains are notoriously difficult to remove from clothing. Dried paint stains are in this category. A dried paint stain may be impossible to remove, but there are techniques that work at least some of the time. If the paint will not peal off your clothing, determine whether it is latex or oil based, then try the appropriate methods outlined below. All the required materials are common household items. Spray a heavy amount of aerosol hairspray directly on the stain, making sure it is thoroughly saturated. The alcohol in the hairspray will lift the paint from the fabric. Set it aside for one hour. Soak the stained clothing in cold water for one hour. Remove the clothing from the water and scrub the stain with a hard-bristled brush. Continue scrubbing in a circular motion until the stain is gone. Repeat Steps 1 through 3 if necessary. 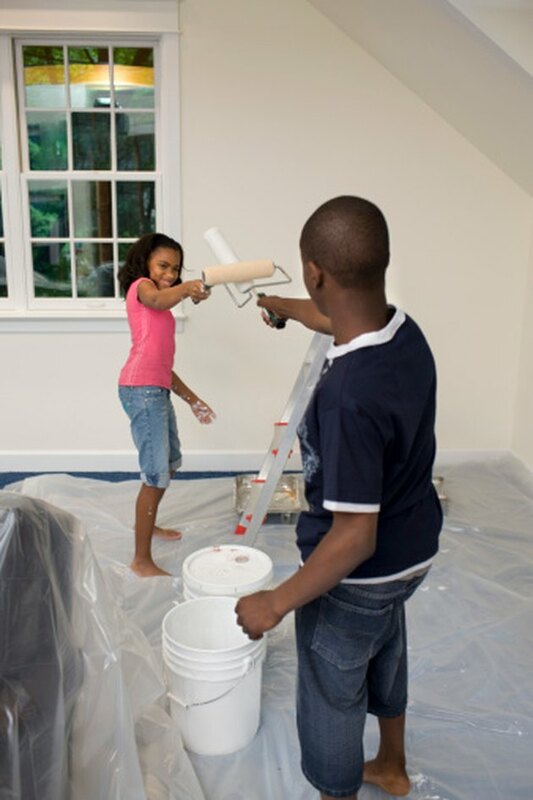 Spray the paint stain with a lubricant-cleaner, such as WD-40, making sure the entire stain is covered. Rub the lubricant in with a sponge. Wipe the stained area with a clean cloth. Continue this process until all paint residue is removed. Add more of the lubricant if necessary. Soak the clothing in warm water with mild dish soap. Remove the clothing and scrub the stain once more. Repeat Steps 1 through 3 until the stain is completely removed.